The first equestrian athlete to be sponsored by Nike, the 21 year old from Texas has been going from strength to strength since Nike came knocking 4 years ago. As well as an up-and-coming Dressage athlete, Ayden is also a passionate believer in promoting equestrian sport to young people and empowering them to take control of their own lives. Ayden, how has your life and career changed in the past few years? Nike has been the biggest moment of my career and will forever be so. Without them I most likely would have had to leave the sport. For me, Nike opened up an entirely new area of growth. Ha! Yes. I love hiking, snowboarding, biking and trying new sports - I enjoy trying to get my friends off the couch and out into the mountains or on the beach! I also go to the gym regularly for training in pilates and with free weights, but I prefer the great outdoors. Also, I ride as many horses a day as I can. This is itself a severe workout. As equestrians we get intense core work in particular. I’ve always been a very healthy eater and I have had maybe two sodas in my whole life! Like most competitive athletes, I can’t stay out late and am very strict with my diet. That doesn’t mean that occasionally I can’t eat birthday cake or have a donut though! I live on fruit smoothies with peanut butter, yogurt, fish, and vegetable stir-fry. There are some that would say the horse does all the work and the riders are not real athletes. What do you say to this? Let me tell you a story: In elementary school our gym teacher was giving extra credit for outside sports and she refused to give me credit for riding because she said ‘the horse did all the work.’ My trainer invited her over for a free lesson. After the hour lesson she had to call in sick the next two days at work because she couldn’t walk. She decided to give me the points! 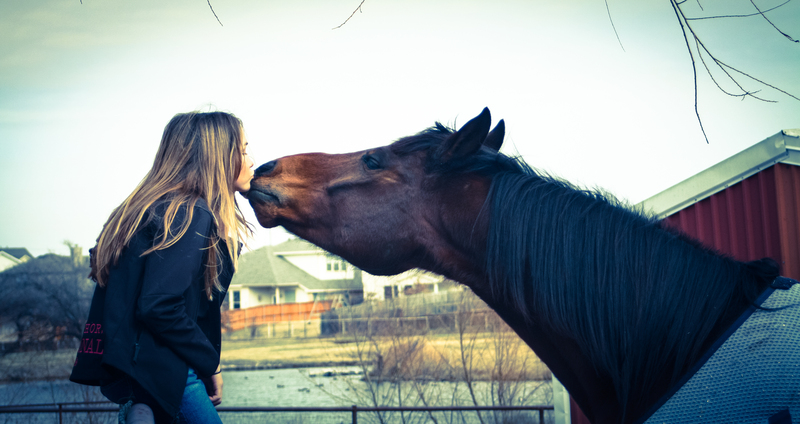 Tell us about your horse Sjapoer and your relationship with him. You must be close as you spend so much time together? Sjapoer (SJ) is my best friend the best horse a young rider could have. He and I spend hours together every day of the week and our bond is really close. In the five years we have been together, we’ve learned a lot from each other. I have also learned from SJ how to stay calm in a crisis and to quickly adjust to unforeseen events. I think these are some of the best reasons for parents to get their kids into equestrian sports - they build confidence in an unusual way. If I can learn to deal with an out of control, half ton animal then life’s problems don’t seem so big! What’s the big deal about horses anyway? Why do so many people go crazy over them? Horses have done our work, carried us to battle, taken us on grand adventures and sailed the seas with us. Maybe that is why we love them? They give us affection and love without judgement. We learn about responsibility and loyalty both from them and by having to care for them. No one takes care of my horse but me. I feed him, I bath him, I graze him and I put on his polo wraps every day. When he gets sick, I stand by him for hours while he gets fluids. I’ve jokingly said if SJ was a man I would marry him! My favorite music tends to be Etta James, Adelle, or the Johnny Lang style, but I listen to everything from rap to classic rock to jazz. Chocolate is my weakness. I also indulge in really nice hair conditioners. We live in the barn, in sweat and shavings and dirt but it always makes me feel better to have silky wonderful smelling hair. I adore living in SoCal. You can't beat the weather. However, my uncle had a place on Crooked Island in the Bahamas. It was destroyed in their hurricane last year and I have been devestated. In my mind it was as close to heaven as you could get on Earth. There were very few people on the island and you could be on the beach for days without seeing another soul. It is amazing. Hunger Games and Divergent. But my all time favorite movie is Pride and Prejudice with Keira Knightley.